Connector, MOLEX F 90°, 4 pin, plastic, beige Plastic connector socket type MOLEX, female with 4 pins, beige color and pins 90°. Connector IDC, female, 6 pins, 12x10.5x6mm IDC connector, female with 6 pins, contact socket 2.54 mm, gray color and overall dimensions 12 x 10.5 x 6 mm. D-Sub connector, Canon, 9 pins, male, THT D-Sub connector with 9 pins Canon for THT mount, male. Connector, band, socket, male, 50 pins, 2.54mm pitch, THT Ribbon socket connector IDC male, pitch 2.54 mm. 40 Pin Ribbon cable Connector, IDC DC2(40P), male, 2.54mm 40 Pin flat cable Connector , IDC DC2(40P), male. Pin header, 7 pins, 18mm, 90° Pin header, 90° angled, 7 pins and 2mm pitch. List Price: 0.14лв. VAT Incl. 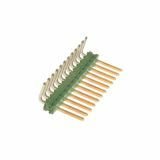 Pin header, 12 pins, 30mm, single Pin header, single, 12 pins and 2 mm pitch. Pin header, 23 pins, 55mm, 90° Pin header, 90° angled, 23 pins and 2mm pitch. Pin header, 10 pins, 24mm, 90° Pin header, 90° angled, 10 pins and 2mm pitch. Pin header, 14 pins, 35mm, 90° Pin header, 90° angled, 14 pins and 2 mm pitch. Connector rack, 13 pins, 30mm, 90° Connecting rack, angled, 13 pins and 2 mm pitch. Military connector, 16 pins, male-male, aluminum Connector, military, C16B for DC or DC circuits. Number of pins 16. Male / male. Pin header, 40 pins, 2.54mm, 90° Universal DIP socket for DIP 40 integrated circuits with 2.54 mm raster and pins 40. Pin header, 9 pins, 21mm, 90 ° Pin header, 90 ° angled, 9 pins and 2mm pitch. Sockets, telephone jacks, phone headset connectors, socket connectors, LAN cable connectors, pin ribbon connectors, IDC connectors, socket outlets, USB connectors, RJ45 connectors for PCB. 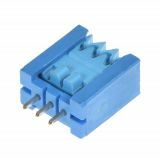 A wide variety of signal connectors at excellent prices.